I currently am snacking on this fudge while writing about this fudge and all I can think to say is: YUM. WOW. CARAMEL. Which, really, is about all you need to know regarding this fudge. OK, I guess you also need to know that it’s made with Twix bars, which have been my most favoritest candy bar since youthdom, along with white chocolate chips and even more caramel. Caramel on caramel on chocolate on cookie in fudge form — yes, that’s right. YUM. WOW.
. I do not exaggerate at all when I tell you that looking through this book alone is addicting. There is page after page of pretty candies, chocolates, marshmallows and more. And I also do not exaggerate when I tell you that it was painstaking to decide on the recipe to make first. Homemade salt water taffy, chocolate-dipped potato chips, lemon cream pie truffles, birthday cake fudge, crazy candy deep-dish cookie cake… AREYOUKIDDINGME. So, you can understand my dilemma. But alas, the memories of my youth beckoned me to make this fudge, and I obliged. The excuse to buy a bunch of mini Twix bars may have swayed me, too, who can say. I’m so happy I did finally settle on this recipe, though, because the end result is little cubed bites of sweet white chocolate swirled with caramel and chopped, slightly melty Twix bars that all combine into what is now my fave fudge flavor in the history of fudge-kind (and I’ve had a lot of fudge, which I can blame/thank all the small town main streets in America for supplying). Sally, I bow down to you and your candy geniusness. 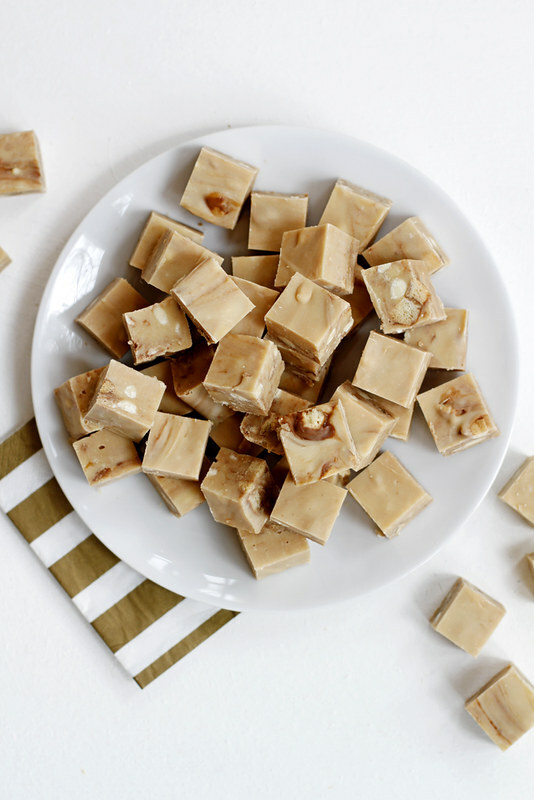 Even for a fudge lover like yours truly, this recipe makes a boatload o’ fudge so I suggest you make it with plans to share it at a party or give some of it away as a gift. It’s also just begging to be the recipe you go to to use up those Halloween candy leftovers. Much as I love the Twix going on here, I can also see Snickers and Milky Way bars working well in this fudge. Heck, maybe even use all three! Too crazy? Never, says this fudge. You know what else this fudge says? YUM. WOW. CARAMEL. Line 8-by-8-inch pan with foil, leaving overhang on sides to remove fudge later. 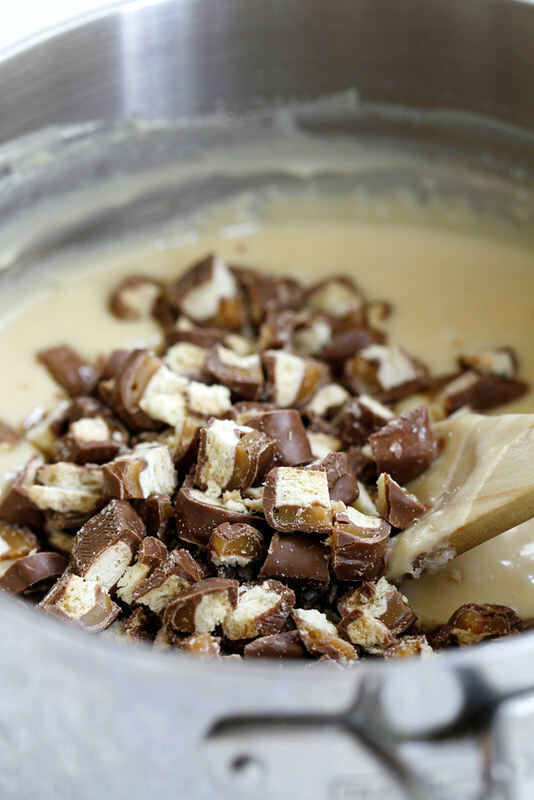 In medium saucepan over medium heat, combine condensed milk, caramel and white chocolate chips. Stir constantly with wooden spoon or rubber spatula until chips are melted and mixture is smooth. Remove from heat. Stir in vanilla and salt. Cool mixture 10 minutes. Slowly and carefully fold in chopped Twix bars (to keep chocolate swirl intact). Pour and spread mixture into prepared pan. Cover pan with foil and refrigerate 4 hours or store at room temperature overnight. Remove fudge from pan using foil as handles. Use sharp knife to cut fudge into 64 1-inch squares (if fudge has been refrigerated longer than 4 hours, let fudge sit at room temperature 20 minutes before cutting). 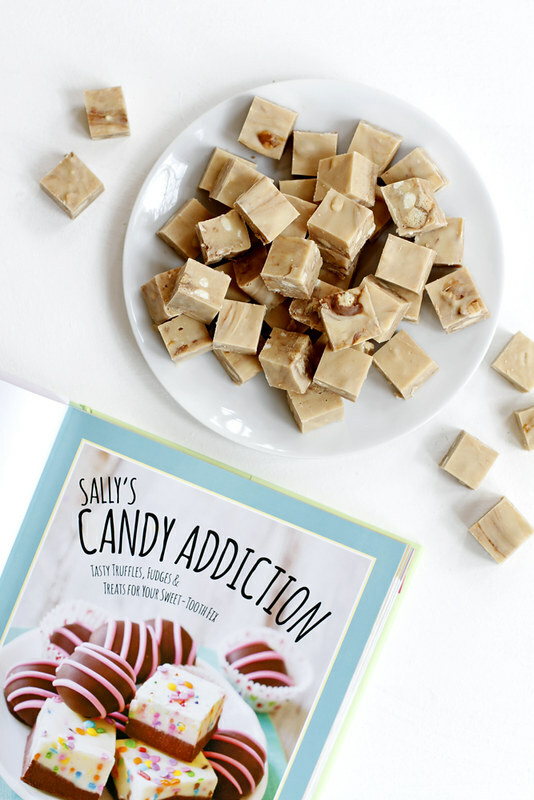 Disclosure: I received a copy of Sally’s Candy Addiction for review purposes only. All opinions are my own. This post contains an affiliate link. I love the shots of the cubes, but I know I wouldn’t be able to eat just one!! Gorgeous photos Stephanie!! I hope you are saving some for me! And, I agree with Erica, beautiful photos! Holy yum! This looks so sensational. 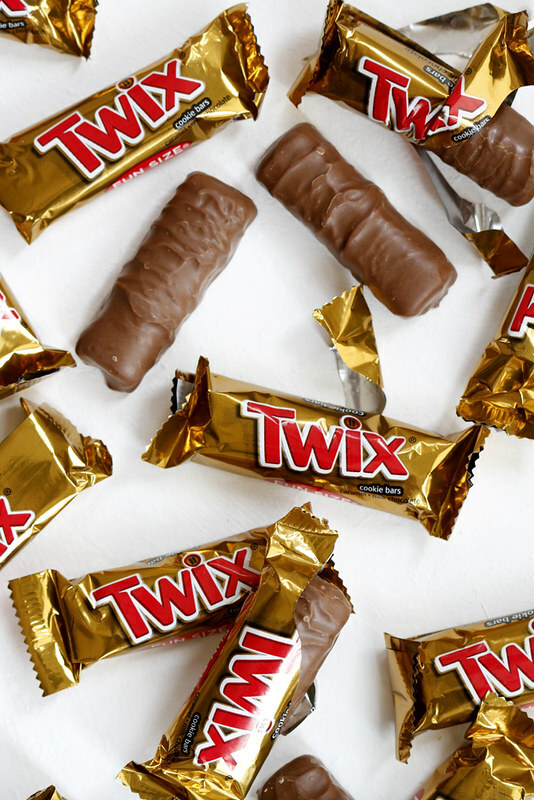 Twix is what youth memories are made of and this is like the adult version of that! YUMMY! Twix in there too?!?! Awesome!! This fudge looks so good! 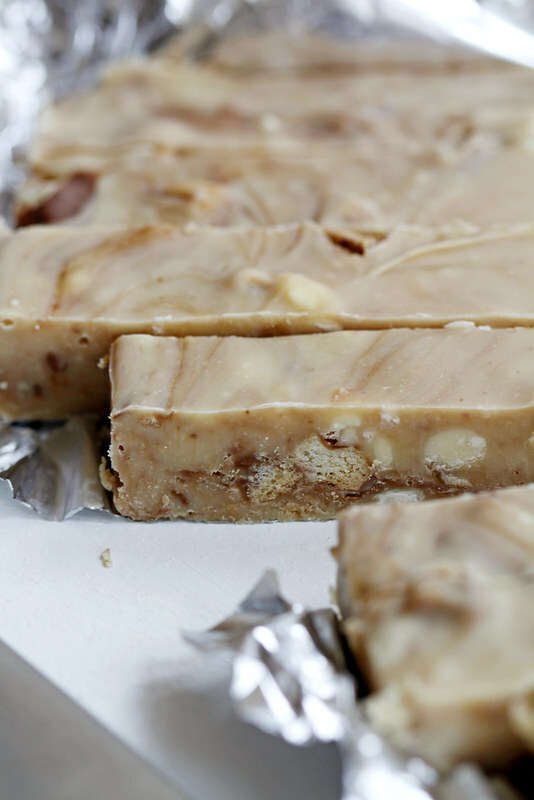 Twix bars are just heavenly and to add them into this fudge is like the coolest thing ever! The only thing I’m thinking right now is how delicious that will taste! Love it! Whoa! This looks amazing and addicting. Twix was always my favorite candy bar growing up. Lovely photos dear! OH EM GEE, Stephanie. I can practically taste this! I think I need to get my hands on Sally’s new book! That looks so delicious! What a decadent dessert! this was made for me!!! twix is my fav!!! Oh goodness, this stuff looks addictive! I have also loved Twix bars since my early days, so good! This is absolutely genius! 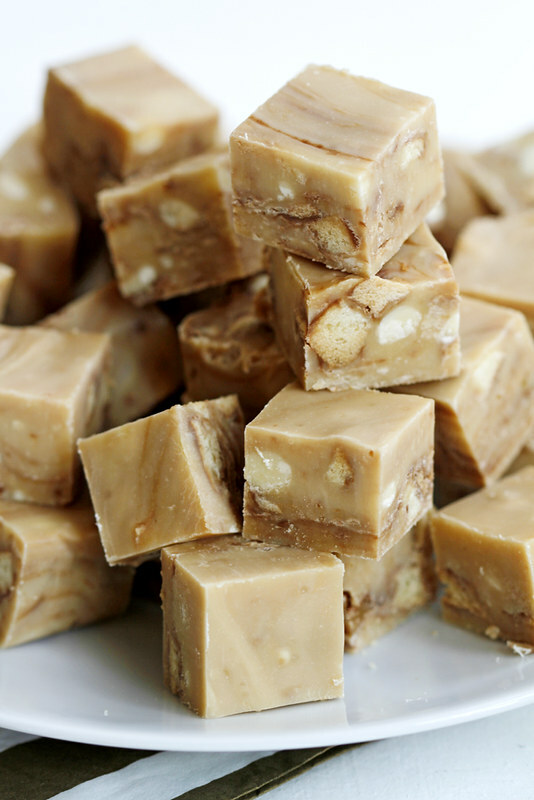 I need this fudge in my mouth asap. 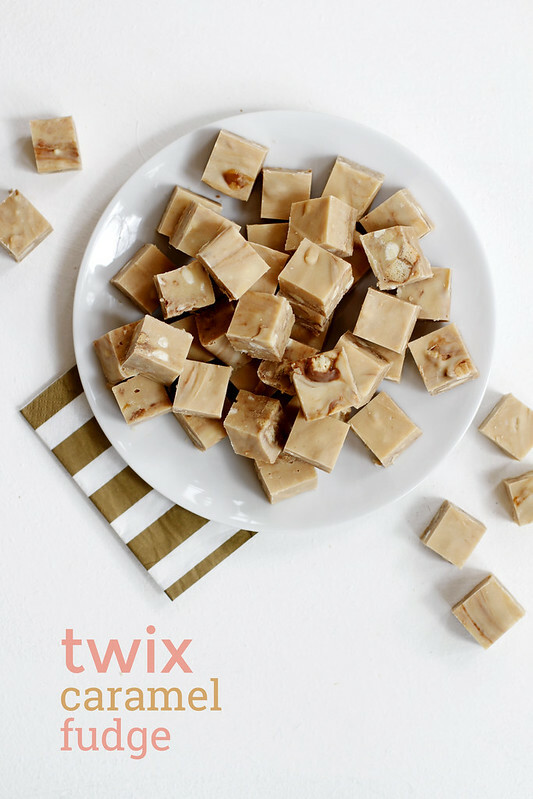 Love the idea of chopped up Twix in fudge! This fudge would disappear in a hurry at our house! could you please explain for the Europeans what is caramel sauce? I don’t think I’ve seen that here in Germany before. Could I replace it with, let’s say, Maple Sirup?